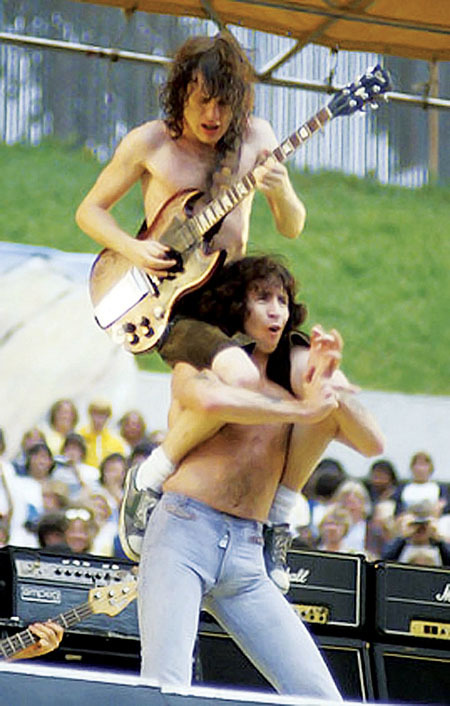 AC/DC’s Angus Young and Bon Scott in action. AC/DC ARE the greatest band to ever come out of Australia and Galway AC/DC fans can enjoy Aussie tribute band ACCA DACCA who play The Quays tonight. ACCA/DACCA was formed in Brisbane Australia in 2000 by Larry Attard, who will take on the roles of Bon and Brian for the show, and he almost got the chance to be a member of the band. In 1980 he was called into Albert Studios, to meet AC/DC production team George Young and Harry Vander. However for whatever reason it did not come to fruition. David Young (Angus ) will roam the stage in full schoolboy uniform, Mat Rath (Malcolm ), will hold down the rhythm guitar, while bass and drums are David Taylor [Mark/Cliff] and Jesse Attard [Phil] respectively. The band have toured Australasia widely to great popular and critical acclaim and their shows take in all aspects of the band’s career throughout a two hours 15 minutes set. They also record original material, under the name Snake, which they will perform on the night. Show is at 11pm. Admission is €10.